G is coming home today. He had a great time, as did I, but I've missed him. It will be nice to have him home. 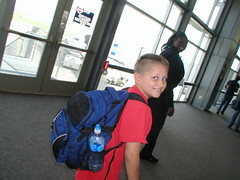 G says goodbye as he walks to the Jetway to fly to NYC. I wish I could keep him. He is a peach. But I'm glad you shared him with me a little. We had a wonderful time. My kids thought it was great fun to meet G last week. I didn't make my first solo flight until I was in my teens. Of course, I had to wait until the Orville got off the dam- seat.